Does the city represent a new landscape for women accessing land to grow food? 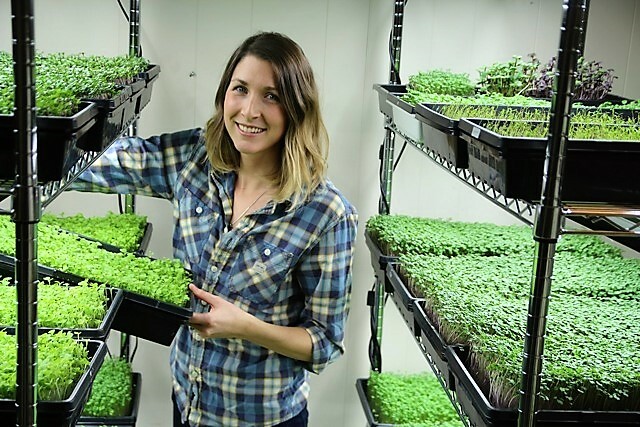 Vanessa Hanel in her basement farm, where she grow micro greens. Studies prove that increasing numbers of women are getting into farming in North America. But while more women are pitching in on the farm, the old Farmer Joe stereotype still has a grip on the reins of rural food production. The statistics don’t lie: Fewer women own farmland than men. It’s estimated that only 27 percent of farm operators in Canada are women. Numbers are even lower in the U.S., with a mere 14 percent of farms headed by women. What’s causing the major gender imbalance in agriculture today? We could blame history, which has largely defined who drives the tractor in society. More than a century ago, European farmers settled in North America and dropped seed into the soil, raising their sons into farmers and their daughters into “farmer’s wives.” Culture maintained the practice of transferring land and farming knowledge from father to son, while women accessed land through their husbands. Women’s efforts on family farms around food – growing, preserving, preparing, and distributing – are often celebrated in history. But rarely do we talk about how the tradition of inheritance plays a part in the small percentage of women who own farmland today. Rarely do we talk about how the tradition of inheritance plays a part in the small percentage of women who own farmland today. For one, it’s never been more expensive for aspiring female farmers to secure land. (Or, really, all farmers.) In Canada, the value of land increased by 113 percent from 2000 to 2012, while in the U.S., the cost of farmland in Iowa jumped 31 percent in a single year alone. In 2015, the United States farm real estate value, a measurement of the value of all land and buildings on farms, averaged $3,020 per acre. “I don’t think I’ve ever considered owning farmland,” admits Hanel. Hanel’s approach to farming in the city has paid off. Moving into her third year as a grower and business owner, her creativity and entrepreneurship has already turned a profit. 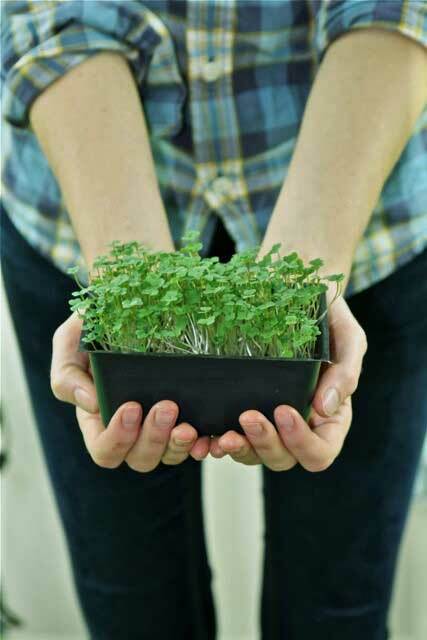 Plus, Hanel’s trying to shake up micro-green production in Calgary, forgoing growing the common alfalfa and pea shoots to experiment with niche varieties like basil, chervil, kale, red cabbage, and mustard greens. She tends the shoots from home, watering, weeding, and trouble-shooting against mold, and packages her harvest into spicy and mild mixes for weekly sale at the Gull Valley Greenhouse’s booth at the Calgary Farmers’ Market. With more than 10,000 people frequenting the market every week, she’s able to sell around 200 units and gross $500 to $800 a week. Hanel is also cultivating relationships with local chefs. Her basil shoots are featured in an exquisite tomato salad at Taste, a trendy kitchen and lounge in Calgary. Hanel isn’t deterred by gender dynamics. She’s forging ahead, carving out new possibilities for women to break barriers of accessing land to grow food in the city. Overall, statistical analysis of the numbers of female urban farm operators in North America is still lacking. But a recent article by The New York Times that interviewed 19 urban farms in New York City reported that 15 of those farms – nearly 80 percent – were led by women. To date, Hanel is one of the only female farmers running her own operation in Calgary, though she hopes it’s just the beginning for other women to follow her lead. While the city offers alternatives to the conventional farm model, the more insidious gender stereotyping about “who can farm” still remains rooted in societal attitudes. But Hanel isn’t deterred by gender dynamics. She’s forging ahead, carving out new possibilities for women to break barriers of accessing land to grow food in the city.